With the emerging trend of having Guam wedding ceremonies, Your Overseas Wedding has launched a partnership with the Guam Visitors Bureau to promote various wedding ceremonies and pre-wedding shooting packages. Situated at the west of the Pacific Ocean, Guam embraces a romantic and stylish ambience with magnificent views and trendy churches. Together with 5-starred luxurious resorts and the love story behind Two Lovers Point, Guam has definitely become one of the most popular wedding and honeymoon places for every couple. With the support from the Guam Visitors Bureau, Your Overseas Wedding joined various wedding expos, aiming to promote and introduce different churches in Guam to peoples. From western style to modern churches, we are committed to providing the best-fit personalized wedding packages for every couple. On top of the church wedding ceremonies in this earthly paradise, we also provide wedding parties and banquets. What’s more, our service is not only limited to wedding packages, but also includes pre-wedding photo shooting packages that are conducted by our local crews. 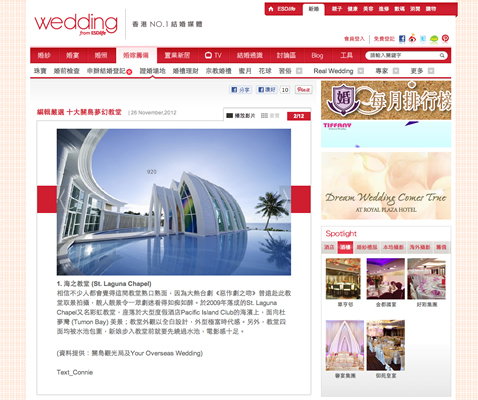 To further promote Guam, we have worked with many different wedding promoting websites and magazines such as ESDlife.com and All About Wedding. 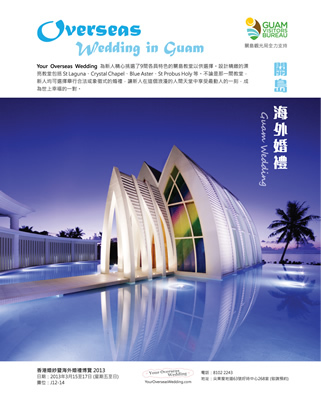 Through spreading our news from various media channels, we hope more and more couples would have the initiative to visit Guam and its alluring surroundings, as well as to have a better understanding about our professional crews in both pre-wedding shooting and wedding planning. We always cooperate to launch various promotional events. For instance, in March 2013, we have co-organized a Facebook event with the Guam Visitors Bureau. 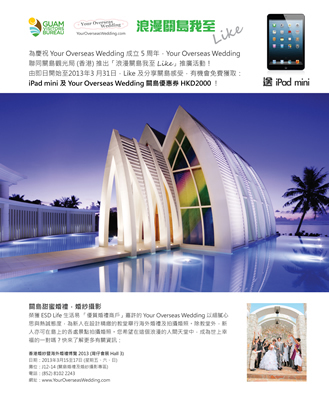 Through clicking the “like” button and sharing experiences in Guam on our Facebook page, customers could have the opportunity to win an iPad mini as well as Your Oversease Wedding Guam Coupons for free.